We are a leading Manufacturer of electronic lorry weighbridge and electronic weighbridge from Chennai, India. 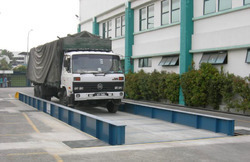 Our weighbridges weigh vehicles dependably and accurately, even in tough industrial environments. Each weighbridge is built to last with a rugged design, robust weight sensors and high quality manufacturing – all backed by industry-leading warranty options. We bring forth high precision Electronic Weighbridges in the marketplace with our technical acumen and advanced technology. They are manufactured from the best quality materials and are fully supported by advanced features like auto power on/off system, high over load capacity, high strain gauge based load cell. Our Weighbridge Scales are used for weighing heavy load of truck and tractors. 5) The calibration and testing for each system is carried out prior to delivery. 6) The microprocessor based electronic indicator is an extremely reliable and user- friendly weight indicator with a green vacuum fluorescent display. 7) The platform of the truck scale is robust to harsh environmental conditions. Our weighbridges weigh vehicles dependably and accurately, even in tough industrial environments. Each weighbridge is built to last with a rugged design, robust weight sensors and high quality manufacturing - all backed by industry-leading warranty options. We bring forth high precision Electronic Weighbridges in the marketplace with our technical acumen and advanced technology. They are manufactured from the best quality materials and are fully supported by advanced features like auto power on/off system, high over load capacity, high strain gauge based load cell. Our Weighbridge Scales are used for weighing heavy load of truck and tractors. Looking for Road Weigh Bridge ?